Now We Get to Worry About Dirt from Outer Space | Passing Through . . . . The May Camelopardalids could bring more than 200 meteors per hour, double what you’d expect at the peak of the well-known Perseids shower. Stargazers have had the chance to see Perseids every July for centuries, but Camelopardalids is brand new to us. The reason: We’re about to encounter the debris field—the stuff that showers into our atmosphere—from the 209P/LINEAR comet for the first time since it was discovered 10 years ago. 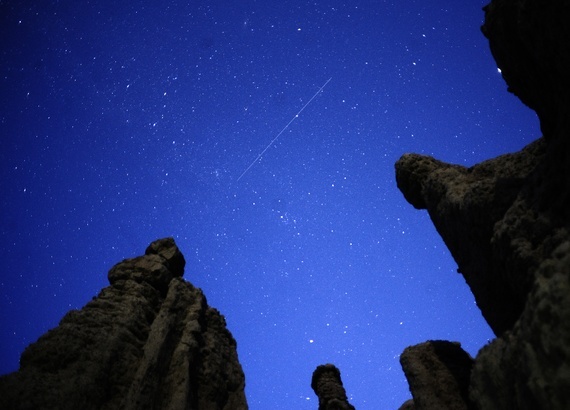 The Draconid meteor shower of 2012, for instance, seemed like a dud from Earth because, even though it had a “huge number of meteors,” they were small and could only be seen on radar. The Camelopardalids shower is part of a debris field that’s about 700 thousand miles wide—about 28 times the circumference of the Earth. “You can think of the debris as on its own little orbit around the solar system,” Cooke said.